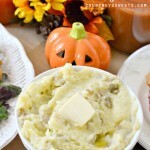 Make the perfect mashed potatoes recipe every time with our mashed potato recipe. Place potatoes into a large stock pot with cold water and place on a medium fire to boil. Once boiling keep an eye on the potatoes and remove once they can be easily mashed with a fork. Drain potatoes and place into your stand mixer. Add in all the ingredients with the potatoes and beat on low speed until smooth and creamy. Don't over beat as it may make them gluey!